Blue Raspberry By Bazooka Sour Straws is an enthralling lip smacking union of blue raspberry candy with sweet & sour sugar. You will get the taste of blue raspberry sour straw on inhale with subtle notes of tang on exhale. This enchanting candy flavor will definitely satisfy your sweet-tooth. 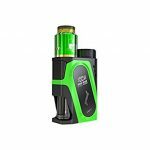 Ijoy Capo Squonk Mod 100w is the first regulated squonker which compatible with 21700/20700/18650 battery and the max output wattage can up to 100W. Featuring a big front OLED screen displays essential information to the user. Next up in Bazooka's Sour Straws series is perfect for fans of watermelon. Tangy but sweet, these are a treat. Next up in Bazooka’s Sour Straws series is perfect for fans of watermelon. Tangy but sweet, these are a treat. A blend of natural strawberry flavour with sweet and sour strawberry candies. The inhale is sweet, exemplified with strawberry flavour, whereas the exhale is a bit tangy. Sour Green Apple Straws by Bazooka Sour Straws brings you the iconic and childhood favourite lip puckering.